Datsun India has officially rolled out the low cost hatchback model, Datsun GO in the entry level car segment. The manufacturer has introduced the model with a 1.2-litre petrol engine, which is borrowed from Nissan Micra. This engine is capable of returning a peak mileage of about 20.6 Kmpl, which is good. The company is offering this hatchback with conventional size 13-inch steel wheels and they are covered with tubeless tyres. 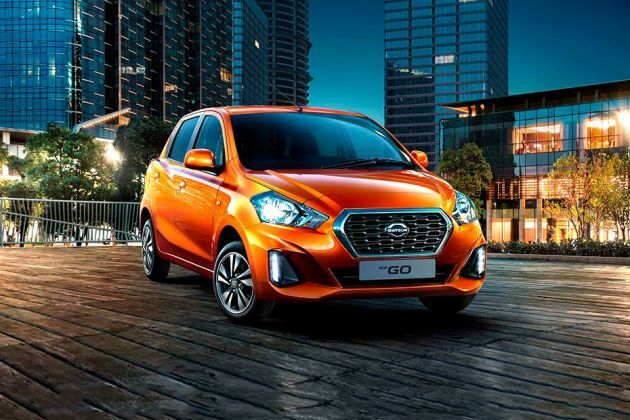 The production version of Datsun GO is available in a four trim levels among which, the Datsun GO A is the mid level variant. This variant comes with aspects like a proficient steering system, ergonomically located gearshift lever and a parking brake, speed sensitive wipers with intermittent and drop wipe function, passenger side external rear view mirror and numerous other aspects. On the other hand, it comes with a decent looking interiors with a lot of space along with a seating capacity for five passengers. Despite being an affordable model series, it is blessed with interesting aspects like spinal support front seats, air conditioning system and many other practical features. This four wheeler with now compete with the likes of Hyundai Eon, Alto 800 and Celerio with its aggressive price tag and the powerful engine. This new hatchback comes with a stylish body design equipped with a lot of attractive cosmetics. The front facade of this hatchback is fitted with a perforated radiator grille with a distinctly designed chrome surround. This grille is flanked by a bold headlight cluster, which is fitted with powerful halogen headlamps. Just under the grille is a body colored bumper that also has a pair of air ducts and an air dam. The rear profile of this hatch is very elegant and comes fitted with a clear lens tail light cluster and a body colored bumper. The rear windscreen is large and it is accompanied with a high mounted third brake light. The boot lid is crafted with a pair of expressive lines , which compliments the company's insignia fitted on it. Coming to the sides, the company has equipped the wheel arches with a set of conventional steel wheels, which are further fitted with wheel caps. The door handles along with the external rear view mirrors are in black color. The company is selling this vehicle in a total of four exterior paint options such as Ruby Red color, Silver, White and a Sky Blue paint. Coming to the insides, this Datsun Go A trim comes with a plush looking interior and comes equipped with a lot of equipments. The leg space in the front is more than other conventional models because of the ergonomically positioned gearshift lever and parking brake, which are integrated to the dashboard. In addition to this, the company has affixed connected seats in the first row, which will create more shoulder space for the occupants. The company has given spinal support for the front seats, while integrating headrests to all the seats. In a bid to enhance the convenience, the manufacturer has integrated armrests to the door panels, while there are assist grips for the rear passengers. Apart from these, it also comes incorporated with a set of utility features like bottle holders in the front doors, storage section for both passenger and driver, interior room lamp , door map pockets and a few other aspects. Furthermore, it comes with a 265-litre boot compartment, which can be increased by folding the bench seat in rear cabin. The company has equipped this variant with the 1.2-litre, in-line petrol power plant, which is designed with three cylinders and twelve valves. The company has used a DOHC valve configuration for this motor and incorporated it with an electronic fuel injection system. It has a total displacement capacity of about 1198cc , which enables it to produce a maximum power of 67.07Bhp at 5000rpm, while generating a peak torque of about 104Nm at 4000rpm. The car maker has coupled this engine with a 5-speed manual transmission gearbox that distributes the torque output to the front wheels and returns 20.6 Kmpl of peak mileage. This newly introduced hatchback series is blessed with a highly reliable disc and drum braking mechanism with front ventilated disc brakes and rear drum brakes . On the other hand, the company has blessed this small car with a robust suspension system. Its front axle is fitted with a McPherson Strut type of system accompanied with a suspension member along with a double pivot lower arm. The rear axle of this hatch comes fitted with a H-type Torsion beam type of system, which is further equipped with high performance linear dampers. The manufacturer is offering this mid level trim with a limited set of comfort features. It comes integrated with a manually operated air conditioning system along with a heater, which also has an air filter. All the seats are well cushioned, wide and have been covered with jacquard fabric upholstery. Here the front seats come with sliding and reclining function, which will be helpful in adjusting the leg space for rear cabin passengers. This trim also comes with features like a digital tachometer, low fuel warning, trip meter, electronic fuel gauge and a gear shift gauge. In addition to these, it also comes with a drive computer featuring a distance to empty indicator, instantaneous fuel economy and an average fuel economy indicator . Its utility based features include collapsible air vents, glove box unit, interior room lamp, ticket holder, front door speaker grille and door map pockets. This Datsun Go A mid range variant is blessed with basic yet very crucial safety aspects. It comes with three point seat belts for the front and rear seats, which will provide better safety to the occupants inside. It also comes incorporated with an engine immobilizer that protects the vehicle from unauthorized access. Other safety aspects include child lock for the rear doors, two point rear center seat belt and a headlamp leveling device as well. 1. Look of the vehicle is very stylish. 2. Interiors space is quite good. 1. Many more comfort and safety features can be added. 2. There is no power steering and music system. డాట్సన్ గో 5 వేర్వేరు రంగులలో అందుబాటులో ఉంది - Red, Silver, White, Orange, grey.